You probably have your whole life on your smartphone or laptop. Photos, work documents, notes and reminders. Some of the things you keep in your devices might be deeply personal, things you don’t want to share with anybody else – including your wife or husband. A successful malware attack can destroy everything. Sometimes it can even expose your personal information for the whole world to see. An antivirus is the first step in keeping yourself safe, but you shouldn’t just settle for an antivirus. You should find the best antivirus. What is antivirus software and what antivirus should I use? Antivirus has always been the go-to solution to fight malicious software and cyber criminal tactics. And it still is. Malware, phishing scams, ransomware, DDoS – these are just a handful of the threats that lurk on the Internet. But let’s start with the basics: what exactly is an antivirus software and what does it do? The definition of antivirus software programs goes something like this: A piece of software designed block out viruses and other malware from entering your device and compromising your personal data or the hardware itself. A good antivirus is a must have. It minimizes the times you have to enter damage control mode to clean up the mess caused by a successful malware attack. Before we go into finding our dream antivirus, let’s see what exactly makes an antivirus, an antivirus. Reactive scanning is the bread and butter of an antivirus. Basically, it scans any new program or file before it’s opened and checks if it is a known malware or if it behaves like one. It’s all done in the background, and the scanned file or program only opens once the antivirus has finished the scan. Then there is the full system scan, where the antivirus goes through every nook and cranny of your device in order to find malware or any other suspicious software or files. Some AVs also block malicious ActiveX or Java scripts from infecting your PC. Plugins based on these technologies can be used to make your PC part of a botnet, inject code or do drive-by downloads. Ideally, the scanner should be lightweight and not hog down your device while still having a very high detection and block rate. However, scans cannot be effective if the program doesn’t know what it’s looking for. That’s why every antivirus software comes with a database of known malware, and compares each scanned file to the contents of the database. This database is updated very frequently, quite often on a daily basis. This is one of the reasons why we always advocate for people to keep their software updated, particularly their antivirus. Updated software goes a long way to protect you on the internet, since it greatly diminishes the possibility of malicious hackers exploiting an unpatched vulnerability of your software. But antivirus programs also make use of something called “heuristic analysis”. This means that it will consider a file to be malware if it behaves like one, even if it can’t be found in its database. This is one reason why some AVs falsely classify some safe programs such as Chrome as a virus. The industry calls this a “false positive” and it is a criteria used to judge the quality of an antivirus. Any antivirus software worth its salt will automatically update itself, both to clean up any vulnerabilities it might have and to keep its virus database and capabilities up to date. Basically, the quicker and more frequent the updates, the better. Sometimes, removing malware can be just as important as blocking it in the first place. Usually, the cybersecurity industry sees the two functions as being separate. That’s why many of the free AV’s out there can only detect and block malware, but won’t be able to remove it if your PC is infected. For that, you will most likely have to purchase the full antivirus solution or download a separate piece of software specializing in malware removal. Ransomware protection: Some antiviruses come with ransomware protection. You select some files and documents to protect in case of a ransomware attack. Afterwards, the ransomware won’t be able to encrypt the blocked files. File shredder: This may come as a shock, but the standard “Delete” + “Clear Recycle Bin” won’t actually delete a file from your hard drive. It will just make it invisible for you to see. But these files can be recovered with a specialized program. In normal circumstances, these invisible files disappear only after being pushed out of their memory block by a new ones. But file shredders destroy them completely and leave no trace of them on your hard drive. Firewall: Some AV’s can filter and scan your internet traffic to detect incoming threats before they reach your device. Other features to look for: DNS Protection, Password Managers, System Optimization, Phishing protection, Antispam, Browser protection. Sometimes you’ll go through a long period where you don’t encounter any online threats and seem to forget that you even have an antivirus installed. “Is it still alive?” you may ask. Well, there’s a test you can do to see if it still works. So how do you test your antivirus to see if it’s still active? Basically, you have to create a “false virus” that triggers your AV’s defense procedures. What you need to do is to create an antivirus test file (a .txt file) . A simple notepad document will do just fine. Then you will need to use a standardized EICAR code. This is something recognized by all antivirus developers as a means of testing if their software is active. Your antivirus should trigger immediately and activate its security protocols to eliminate the “fake virus”. If it doesn’t, then that means your software is inactive/disabled. What’s the best antivirus you could use? Now that you know what to look for in an antivirus, it’s time to find out which one you should use. The major benefit user comparisons and reviews of antivirus software is that you can get a sense of how the product performs in real life. A comparison can help you figure out which is the best antivirus program for you, or whether you should choose the free or paid version. Keep an eye out for users who might be biased in favor of one AV in particular. There is a chance their highly positive review might be ‘doctored’. This happens most often on the developer’s review page, but any of the platforms we’ve mentioned below can fall prey to false reviews. Cybersecurity forums are still some of the best places you can check to find good and trustworthy reviews and comparisons of antivirus software. For those who don’t know, Quora is a questions & answers site. Basically, you ask a question and (generally) qualified users answer them. Or you can just browse questions similar to yours and see if you find an answer there. As you can see, these topics are followed by thousands of people, so it should be pretty easy to find the information you need. Here are some starting points that can help you find your best antivirus program. 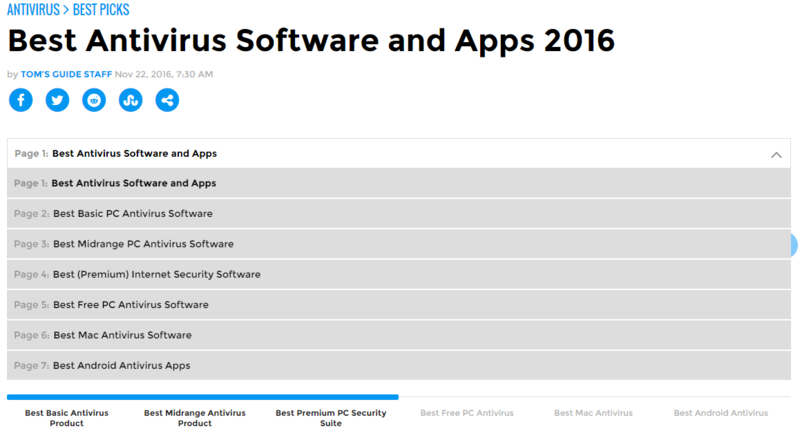 What is the best antivirus of 2016? A similar concept to Quora, but Yahoo! 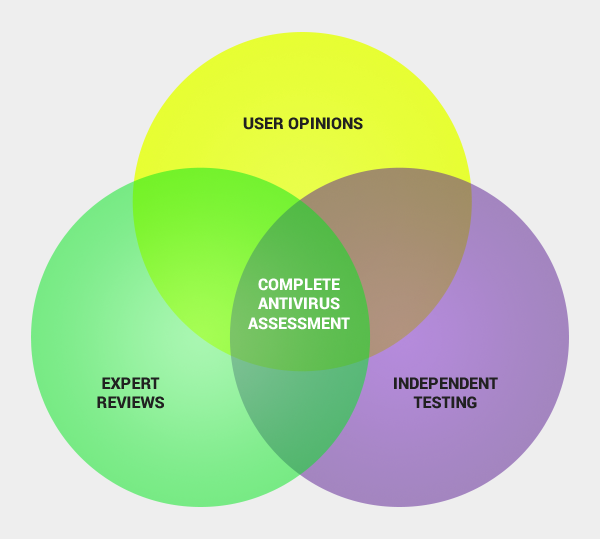 Answers centers on the experience and knowledge of everyday users rather than the knowledge of experts. Use this if you want to read about real life examples and stories rather than well documented answers. Questions such as “What is the best antivirus” will yield quite a lot of different opinions, and many of them will come with personal accounts and reviews of any given software. Which is the best antivirus for Windows 7? A treasure of the Internet hidden in plain sight. Reddit distinguishes itself from Yahoo! Answers and Quora due to its long discussion threads. Ask Reddit users to compare various antivirus software and you will end up with a very lively conversation among users that covers almost every antivirus program imaginable. ‘Redditors’ will talk at length about the pros and cons of one antivirus or another. 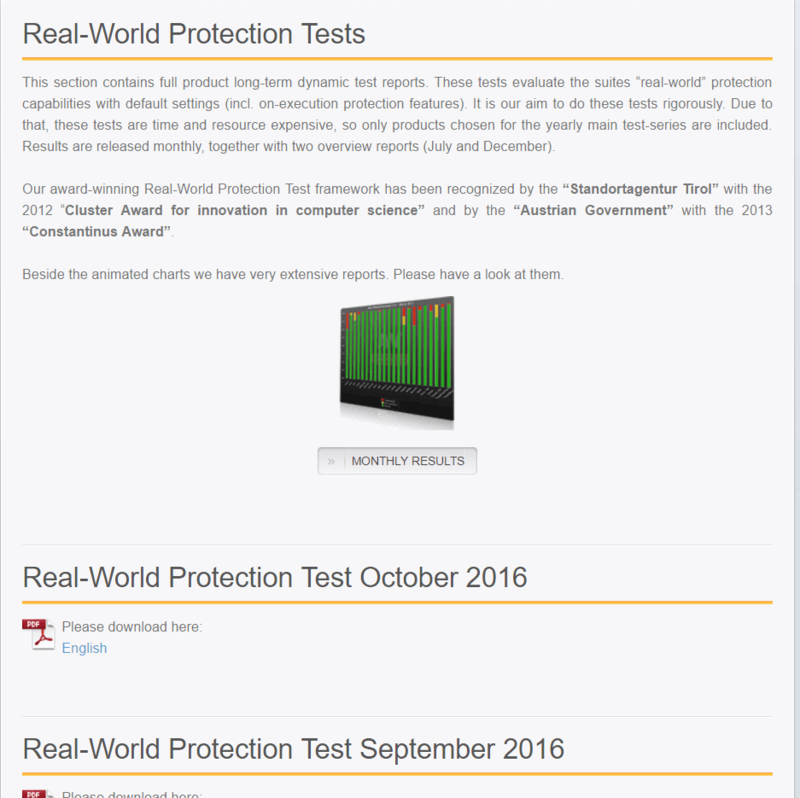 As of September 2016, what’s the best anti-virus/anti-malware protection? This thread is a bit older, but you might still find it relevant: What is the best antivirus to go on a new computer? Reviews of antivirus programs are another way to choose the product that fits your needs. Most people read the reviews on the developer’s page, but it’s impossible to be sure which review is real and which isn’t. Trustpilot offers a way around this since it is an independent reviews platform. Basically, users can post without worrying they will have their negative comment deleted by developers who jealously guard the brand name of an otherwise poor product. PC Magazine is meant to answer any and all questions related to computers and software that runs on them, including antivirus. 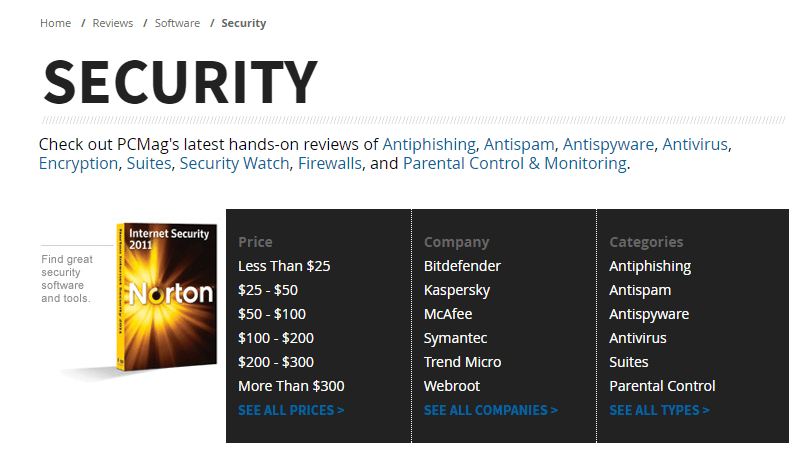 To access the reviews, type “best antivirus” in the search box and choose one of the two top articles by Neil Rubenking (one of the top experts in the field). One covers which is the best free antivirus of 2016 while the other one is about the best paid antivirus of 2016. 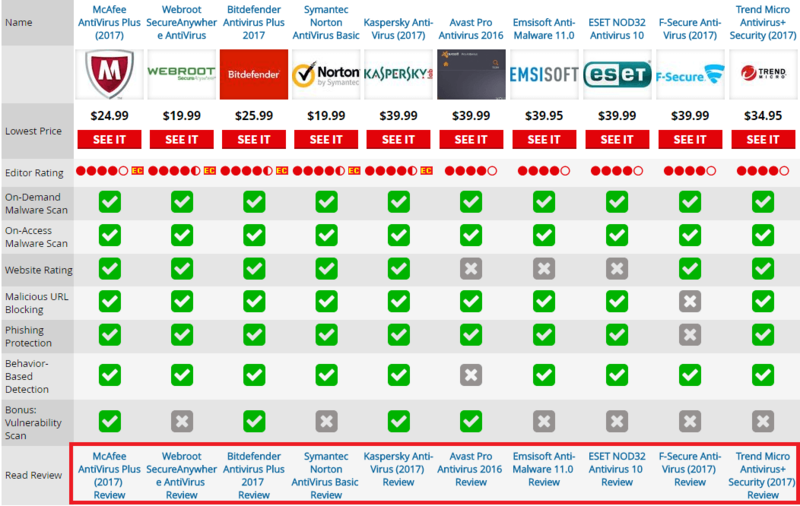 Below is an image of the best antiviruses as rated by PC Magazine. If you want a more in-depth look, press the blue text at the bottom of each antivirus column. If you access the review for the products, you will notice the available price, and a few conclusions (Pros, Cons and Bottom Line) in case you don’t have time to read the article. To see even more articles and filters, press the “Security” tab just above the page title. This takes you to a useful part of their website where you can filter antiviruses by price, company, and categories. The Category filter can help you narrow down your search to desired functionalities such as: anti-phishing, antispam, antimalware, antivirus and parental control. Know which are the best antivirus programs of 2016. Know what each program is capable of. Know the most important security features an antivirus should have. Chances are you will own a shiny new antivirus, whether it’s free or paid! This site focuses on all things related to free software, including antiviruses. Gizmo’s reviews and analyses will help you make up your mind on one software or another. Pretty handy when it comes to choosing your dream antivirus. Do keep in mind these are only the free antivirus versions, and thus might not have the full functionality of a paid one. Tom’s Guide mostly focuses on electronic gadgets such as smartphones and laptops, but it also has a thorough antivirus section, complete with reviews and rankings. On the main page of this section you can find a drop down menu which covers four price points for PC antivirus: Free, Basic, Midrange and Premium, and another two categories for Android and Mac AV’s. For a lot of people, Softpedia is a one stop shop for many of their software needs. They have a huge list of around 600 various free or paid antivirus software and programs available for download. A great starting point if you want to take your time and just browse at your own pace. The test center from PC Advisor puts to the test about 17 antivirus products in the market for the UK public. That doesn’t mean you can’t check them out for yourself and decide if one of them is good enough for you. Reviewers know which antivirus is better at blocking and eliminating malware by thoroughly testing them. By using the same antivirus testing sites, you can get a better picture of what the AV your want is capable of. For the best results, antivirus tests have to be as objective as possible. This article can tell you all about the standards and principles these testing sites must respect. An independent service provider in IT security that analyzes the latest malware, using the best security solutions available and informs the public on the top-quality results. 1. Select what exactly you want to learn from the tabs in Test results according to area of application. We assume you are a Windows user, but you can choose whichever operating system/device you use. 2. In the new page, use the menu on the left to select your Windows version and the period when the tests were conducted. 3. Browse the antiviruses on the list. An antivirus can obtain a maximum of 6 points for every criterion. 4. Let’s choose for our example, Bitdefender Internet Security 2016. Protection – Protection against malware infections, which include zero-day malware attacks, including web and email threats. Performance – This measures the impact an antivirus has on your PC’s speed and general performance. Usability – Impact of the security software on the usability of the whole computer. To get a better idea about each set of data, you can take a look at the right where the Industry average is posted. 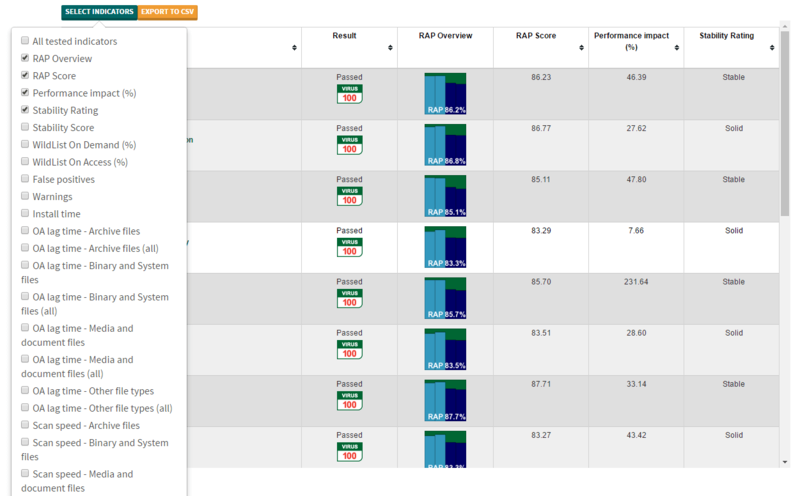 If you are not sure about a certain product, you can select from the top menu: Tests > Compare manufacturer results. This way, you can compare one antivirus software to another and see which one better suits your needs. AV Comparatives is an independent antivirus testing agency known for its accurate reports and thorough measurement procedures. The go-to tests most likely to interest you are the “Real-World Protection Tests” and “Performance Tests”. This is the most relevant test because it shows many viruses it blocks in “real-world” usage. A good antivirus should have a protection rating of 99% or more, meaning they protect you against 99% of malware attacks. You can see either an interactive monthly graph by pressing “MONTHLY RESULTS” or just check the detailed monthly reports. Do keep in mind though, a 99% test result might not be relevant to your time using an antivirus. You might be attacked with a malware or rootkit, that wasn’t part of the test, which the AV developer doesn’t know about or didn’t get to update quickly enough. Take this into account when going over the test results. These tests were done with PC Mark 8 Professional Testing Suite, an industry-leading benchmarking software. You can find the scores and results of each test on pages 9 and 10 of each report. For example, page 9 centers around is all about PC performance during file copying, archiving, installing, encoding, launching apps and downloading operations. Scroll down to page 10 and you can see the PC Mark 8 points achieved by each software. If you are still not convinced on a product’s abilities to keep you safe from malware, we recommend running another 2 additional tests: File Detection Test and Heuristic/ Behavior test. An antivirus is only as good as its malware detection. That’s why AV Comparatives releases monthly reports on how well antiviruses can detect malware. How many false positives the antivirus produces. A false positive means the antivirus mistakes a normal file with an antivirus. The success rate of an antivirus in detecting malware. The quick and dirty results with detection rates and false positives are at pages 7 and 8. False positives are an important antivirus testing metric because they can impact your device performance. If a file belonging to a program is mistaken as a virus, then your AV will treat it as such. Thus, you may end up with a non-functioning software. Simply hearing the words “heuristic analysis” probably makes you scratch your head. Heuristic analysis is a defense system against new and unknown malware. Basically, an antivirus notices a suspicious new software, and then analyzes it to know what it does. During the analysis, the antivirus opens the program in an isolated virtual machine, meaning a PC-within-a-PC, and tracks everything the suspicious program does. If the suspicious software starts to show malware-like behavior, then the antivirus flags it as such and activates all of its security features to annihilate the threat. AV Comparatives tests this feature of antivirus software every year. 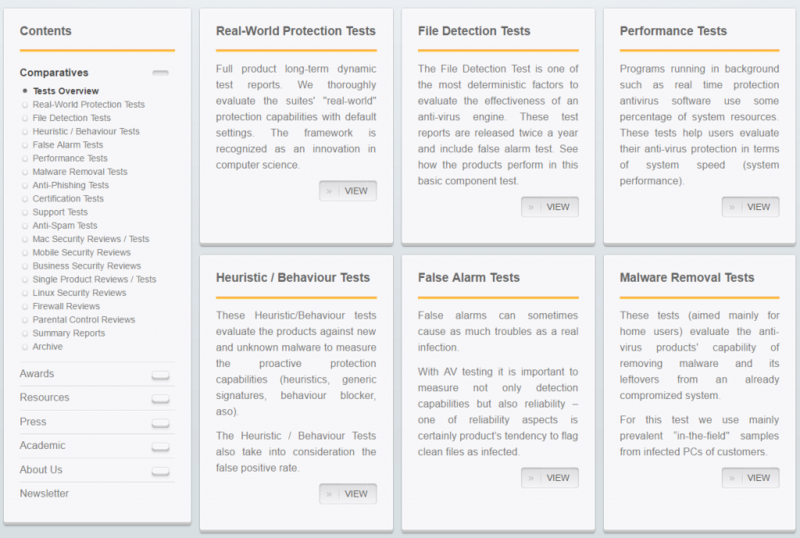 You can find each report in the “Heuristic / Behaviour Tests”. The important information is at page 5. This test evaluates an AV’s capabilities against phishing attempts. These usually occur by email or instant messaging, and lure the target into either entering sensitive details on fake websites or download and open a malware infected attachment. As in the previous tests, you can go directly to page 4 and see an overview for each antivirus, complete with percentages of blocked phishing websites. Virus Bulletin is an important benchmarking and comparison site for the entire antivirus industry. It measures just about everything you can think of, including install times, scan speed, stability, performance impact, false positives, detection rate and so on. The site can be pretty confusing at first, given all of its features and options, so let’s make a sense of the madness. On the main page of the website, go to the top right corner and press the “VB Testing” tab. 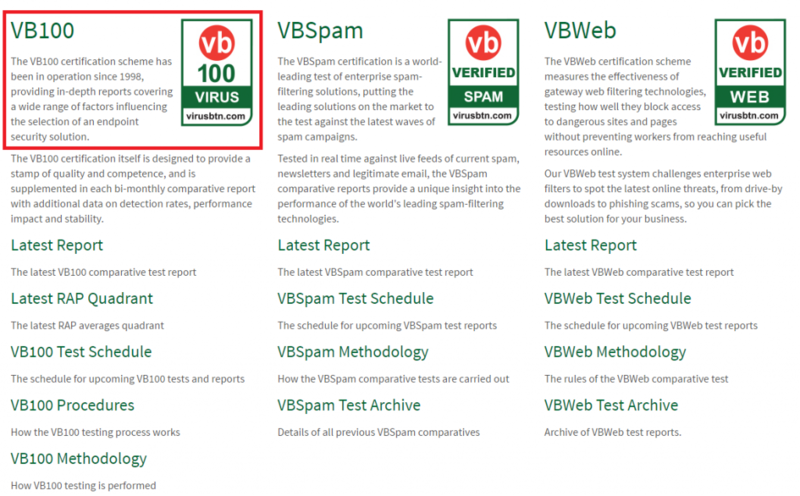 This will take you to a new page with 3 separate test reports: VB100, VBSpam, VBWeb. This time, we will take a look at VB100, the rigorous testing standard that made Virus Bulletin such a go-to resource for antivirus comparisons. 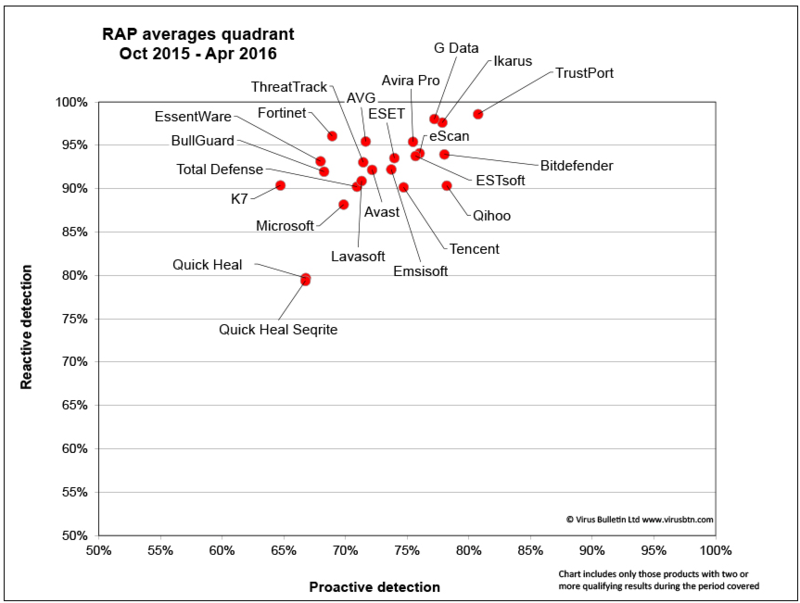 For a quick overview of every antivirus, check the “Latest RAP Quadrant”, (RAP comes from “Reactive and Proactive”). This will take you to a page with a two-dimension graphic. The Reactive dimension measures how well the antivirus can detect known malware. The Proactive side tests the AV’s ability to adapt and detect new malware that AV developers haven’t yet discovered and patched. For the in-depth results, go to the “Latest Report” page. This is a list of antiviruses that passed Virus Bulletin’s extensive tests. On the left of the table you can select what indicators you want to measure. Just about every single aspect of an antivirus you can think of, with all of them being measured. This will give you the most complete opinion of what a software can, or cannot do. Checking a few details on the antivirus developer’s website and patch notes can help you get a better idea of how seriously they approach updates and bug hunting. For example, highly detailed patch notes will give you a better picture of what you can expect from the company in terms of reliability. And this applies for other types of software as well, not just antivirus or other security solutions. This article includes very useful tips to help fill in the blanks in your research. After all these tests, from AV Test, AV Comparatives or PC Magazine, you probably noticed that some antivirus products always seem to come at the top. This is normal. These antivirus developers have been in business for a long time, and have constantly perfected their software and procedures. Most antivirus programs now come with a trial testing period to help you decide if you actually want it or not. The trial period is especially useful if you have doubts about a certain product or you can’t decide between two or more AV’s and want to see them in action. Keep in mind though that using two or more antivirus programs at the same time isn’t a good idea. The antiviruses will end up thinking each other is a malware, or compete in order to eliminate viruses and significantly drag down your device performance. First, security software alone can’t keep you safe online. It’s a widespread belief in the cybersecurity field that the best antivirus is you, meaning your judgment and general internet savvy. After all, it’s safer not to click the link rather have your antivirus work to eliminate the malware from your PC. Second, no single antivirus solution is enough to keep you safe, not even our own. We and most antivirus developers encourage you use multiple security software programs to keep you safe. If malware passes one software, they will have to face another, and with each new step chances of infection drop dramatically. This article was initially written by Aurelian Neagu in 2014 and was updated by Paul Cucu in November 2016. Avast support phone number is among the leading applications for offering the World class security, security, and privacy. This is a great post on how to write a really good blog. The detailed explanation is really helpful. Great post. Nice post. Absolutely great post here. Thank you for Blog posting.. I am waiting your next post.. Thank you so much for sharing this article and the lot of enjoyed it. Bitdefender is one of the most brands of antivirus present in the industry today. You don’t have to worry and without delay take help from Belkin customer service help number UK. Thanks for the supportive article, I really enjoyed this Article. While having your trouble creates to antivirus, so for all this, you need to right away contact us via Kaspersky Help Number team. Recently QuickHeal anounced that an amazing update will come in their “QuickHeal Total Security”. It will help us to fix the difficult problems. So its time to start using Avast. Great article to share very informative, however I am very happy with Heimdal Thor Premium Home, great perfomance no noticeable impact on system resources excellent reviews. Kaspersky Internet Security is a Internet Security Suite which protects our system from malware, email spam, phishing, hacking attempts, data leaks as well. Kaspersky Antivirus are resulted by MIT Specialist. I must say that you have written the best resolution for fixing my problem. Any Avast user, who is getting issues while fixing any problem, just contact Avast Helpline Number For UK for rectifying your problem. 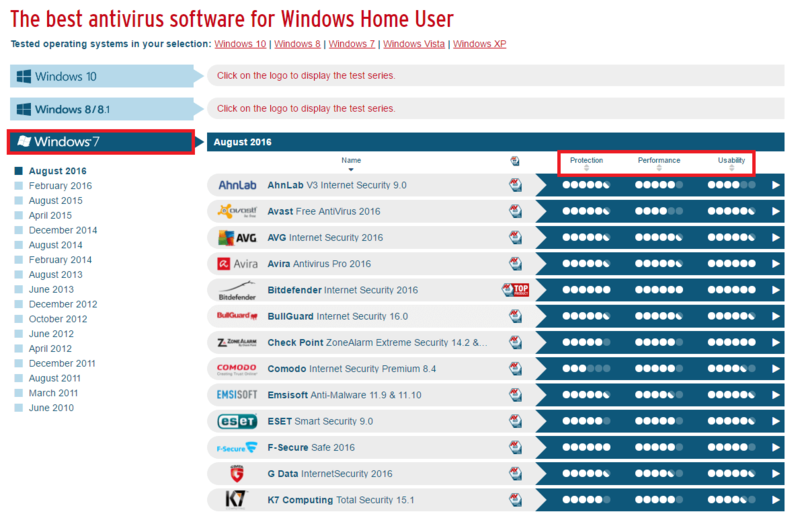 Kaspersky Antivirus performs very well in Malware Detection Test. It can detect 98% malware (Type of virus) from our system over 300 live samples of malware we used. It requires you to on the browser extension before it detects malware threat online. This was a great read about antivirus. With so many new threats cropping up regularly, it behoves one to be prepared and keep our systems safe. The list you have provided for best antivirus programs are really informative. Users will get more sources from your post which is a very good thing for all. Many of them will be aware of the sites but I think most of them don’t have knowledge of this. Thank for such an informative post. The best antivirus can be decided only by the user as every antivirus has its own functionality and the user needs are more important than to select any one of the antiviruses. Which antivirus is as per the need of the user is important. “thanks for sharing such an informative content with us.I have been using Norton Anti-virus since many years and it has many cool features. Very good and balanced article – well done! The post is as informative as a information needs to be. A user is in need of the anti-virus and how the anti-virus should perform or which antivirus will be good for the user as per the need of it. Contact for all technical Problems with Outlook. Good to share this post. This is a really informative blog and really useful. I am thinking to buy the Norton Antivirus from http://www.install-nortonsetup.com/ My friend had it installed from here and it works like a charm. This indeed useful and detailed guide for not only beginners but for tech geeks as well. Highly recommend others to read this comprehensive guide and choose wisely to secure your systems and online presence. Thanks for sharing the Guide about antivirus.Nice and welcome. I choose Bitdefender – ordered one license for all devices. I bought on https://bitdefender.in because they provide extended support for my region. Thank you this is nice article..
Hi and many thanks for your kind words! I am glad this article was useful for you! Thanks for sharing nice article with amazing list and headings, I am too glad to read it thanks again. Avast is the best antivirus in my opinion but it uses too many resources, so you may find that it slows down your computer. This articel showed me exactly what I was looking for. I will sign up for your newsletter right away. Running my own antivirus website and your information is really spot on! Hello and many thanks for your feedback! Happy to know you are reading our blog and the information found there is useful. Most comprehensive take on choosing your protection against viruses. Thank you for the effort! Thank you so much for your feedback, Vikrant! We are happy to know this guide was useful and helped you. Thanks for this useful comparison and telling us the what should the best antivirus actually have?. By far, the best article I’ve ever read about this subject. Brilliant. Many thanks for your feedback, Louis!! We are happy to know it was useful. Great! You are providing very useful and amazing knowledge regrading antivirus. Thank you so much for sharing such a informative blog which is having synchronized information , i was looking for these information over different search engines from past few days but fortunately find my solution over here, i will be keep in touch with you over your future post as well. Kaspersky Support for Immediate Solution for Antivirus Issues. Kaspersky facilitate and support variety +1-855-676-2448 is that the best different to decide on to induce eliminate any forms of technical errors that encountered by users on their Kaspersky window. You’ll be able to decision America anytime, as our technical consultant’s area unit out there all the time. The good issue is that kasperskysupportnumber.com. Kaspersky facilitate and support team is sort of professionally trained and holds the unimaginable data to fix-up errors within the minimal time. Impressive research! A very good resource that I will bookmark for sure. Personally, I use Kaspersky. Hello Peter and thank you for your feedback! Virus that make very harm to any PC or laptop, so we are always take care of it. But sometime due to internet or some other reason, our computer get affect from virus. The technique through which a computer get less affected from virus. is derived in your blog and your writing skill is also very unique. Thanks for publish it. Nice post, Thanks for sharing a very informative article. Currently, I’m using McAfee Antivirus Software. It’s good & protect my all business computers. According to my experience I will recommend McAfee Antivirus. Please keep update us like this. Thank you very much for writing this good article. I learned that it is not easy to choose any antivirus from any antivirus products. I am got most help from this article. I realized that it is not easy to find good antivirus from any antivirus products. Thanks! We’re so glad you found it useful, John! Thank you for your kind feedback! AV’s shouldn’t be considered as a first line of defense as they are extremely unreliable when it comes to the zero-day malwares. AV/AM may be an second opinion or cleaning addition to the whitelisting, sandboxing or light virtualization but we shouldn’t really rely on them in terms of real time protection. If someone asks I always recommend Windows own security solutions like Windows Defender and Firewall supported by VoodooShield and Heimdal. Adblocker with good anti-tracking and malware filters is also a must as many infections are coming from malwertising. I’m just wondering, does Anti-Malware software like MalwareFox and Malwarebytes work in the same way? Hi George! Anti-malware products are a bit different and their strength differs according to many elements, such as their intelligence, how it works, etc. But the same criteria to evaluate potential solutions are still the same. I love your How to Find the Best Antivirus, the Ultimate Guide article. Here is useful information for antivirus. Thanks for sharing this important article. Thanks, awesome article! Thumbs up. See security as a onion, layers, defense in dept. Use an av with strong heuristics base, integrity checking, for instance webroot, then look at whitelisting software to make sure only whitelisted exe may execute. Run pc in local account not adminstrator. Great Anti-Virus guide, Paul. Wow, Heimdal Security is like the ‘Windows Secrets of cyber-security’. Personally, I am curious about Webroot Secure Anywhere’s “journaling and rollback” technology. The actions of unknown (not in their database) software are tracked, and can be rolled back if necessary. “Webroot’s journaling and rollback feature should be able to recover from almost any attack, even encrypting ransomware.” (PCMag.com) I know that nothing is absolutely certain, but it certainly does sound like a great feature! One thing is sure — Heimdal Security is definitely the place to go first. All software user this information very informative because nowadays we are working on digital system. So, It is very important for all user that use software system. Thanks for the informative article. Would like to include a point that using a free antivirus software may not be the right fit for you and as soon as you install them, they ask you to upgrade to the full version. The points mentioned above, do certainly come into play while selecting the best antivirus. Get the right antivirus suited to your needs. Hi Pawan! Indeed, our recommendation is to purchase a reliable AV, not use the free versions, who are not enough to provide substantial protection. This list of antivirus will surely be very helpful. Thanks for putting it live. Thats a very good compilation. Perhaps you should include ESET Antivirus in the list as it is secured and no performance issues. I am using it in my business and I feel calm and peaceful about it. We didn’t recommend any specific product, but offered some resources that can help other people choose the right AV for them. Thank you very much for this wonderful article.I think it should be very much helpful for all antivirus users to select antivirus to secure there computer.I have a small IT firm so would you please suggest me which antivirus is best for me Aurelian? A wonderful and best exhaustive reearch I have ever seen in any AV article I have ever read. Kudos! We are very glad you found the article useful! We tried to see things from an user’s point of view and we realized that it’s not easy to choose from so many antivirus products. Thank you! Thank you for sharing the ultimate guide about to find about anti virus. Amazing and resourceful article.Really enjoyed this post. Please keep update us like this.